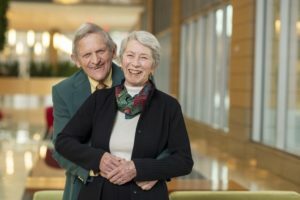 John P. Morgridge and Tashia F. Morgridge, established the Fund for Wisconsin Scholars (FFWS) in December 2007 to help make higher education accessible to talented public school graduates in the state. John and Tashia both serve on the FFWS Board of Directors. John has had a lengthy career as a business executive, an educator and a philanthropist. He is currently chair emeritus of Cisco Systems, a multinational corporation that designs and sells networking and communications technology and services. John joined Cisco in 1988 as President and CEO, and grew the firm from $5 million to more than $1 billion in sales and established it as a Fortune 500 global company. In 1990, he took Cisco public; in 1995, he was appointed chair; and in November 2006, he became chair emeritus. During his tenure, Cisco became the world leader in networking for the Internet. John and Tashia have made access to education one of their top priorities. John and Tashia established the Morgridge Center for Public Service on the University of Wisconsin-Madison campus. They helped the UW-Madison School of Education modernize and expand the Education Building. They donated to help build the Discovery Institute and launch the Morgridge Institute for Research, a private biomedical research institute working in collaboration with the University of Wisconsin-Madison. They provided matching funds to help establish some 144 new faculty chairs to retain and attract top faculty. John is past chair of The Nature Conservancy and serves on the boards of Business Executives for National Security, the Cisco Foundation, the Morgridge Institute for Research, the TOSA Foundation and the Wisconsin Alumni Research Foundation (WARF). John also teaches at Stanford University’s Graduate School of Business and serves on its School of Business Advisory Council. He is Co-Director of the Stanford Leadership Academy, a seminar program for the University’s senior faculty and staff. John also helped launch and teaches at the annual Wisconsin Entrepreneurial Bootcamp at the University of Wisconsin Business School. Tashia is a board member of the Morgridge Institute for Research and the TOSA Foundation, is past chair of the Haas Center for Public Service at Stanford and has been a long serving member of the Wisconsin School of Education Board of Visitors. John and Tashia are both graduates of Wauwatosa High School and the University of Wisconsin-Madison. John holds a master’s degree in business administration from Stanford University. While John was at Stanford, Tashia was an elementary school teacher. She later earned a master’s degree in special education from Lesley University and taught an additional 13 years.